2018 has seen some great new vehicles become available for families and businesses alike. One of the highly rated SUVs you need to take a look at comes from the VW stable. The big 7-seater Volkswagen Tiguan All-Space is now available for us in Australia, and it’s a quality vehicle. Space, comfort, safety and AWD adventure are all part of the Tiguan repertoire keeping your journey exciting and rewarding. Volkswagen’s 2018 Tiguan All-Space SUV boasts a 4MOTION AWD system for superior off-road traction. This is definitely one of the picks for tackling tough terrain, dirt roads and icy roads up to the ski slopes. Small water crossings are a breeze, not to mention heading out onto the beach for a picnic. Only the 110TSI variant is without AWD. All other models come with AWD 4MOTION and the simple round knob by the gearstick to twist for selection between snow, on-road, automatic off-road and variable off-road driving modes. A central driving mode button is also available so as the driver can opt between the Tiguan being set up on-road with Eco, Normal and Sport profiles. The Tiguan’s modern and sophisticated looks are classy, and the performance is every match for its visual appeal. Powered by the smooth TSI petrol or TDI diesel engines, the VW Tiguan has loads of driver appeal. BlueMotion Technology is standard, and you can count on the Tiguan for getting you the excellent fuel efficiency you want. BlueMotion technologies use features like the Start/Stop system and Brake Energy Recuperation to keep the refuelling gaps nice and wide apart. To help protect our environment, the 2018 Volkswagen Tiguan TDI models are now fitted with AdBlue emissions control equipment which cleans exhaust gases. This technology helps the vehicle to comply with the EU6 exhaust emissions regulations. So, we have five lovely Volkswagen Tigaun All-Space models to choose from according to engine and driveline combinations. The model range starts off with the VW Tiguan TSI Comfortline 2WD with a nicely flexible 110 kW, 250 Nm petrol engine which has a combined fuel economy of a round 6.5-to-7 litres/100 km. Next comes the TSI Highline 2WD with the same engine and driveline but it adds some nice extra features like 18-inch Nizza alloys, LED headlights, an Area View camera + Park Assist, keyless entry and an electric tailgate. Next we jump into the AWD models which start with the Volkswagen Tiguan All-Space TSI Highline 4MOTION. This model has the more powerful 132 kW, 320 Nm TSI petrol motor with plenty of poke and an average fuel consumption of around 7-to-8 litres/100 km. You will enjoy features like 19-inch alloys, leather trim / partial leather, heated front seats, Discover Media with an 8-inch touch screen and an Active Info Display. The Volkswagen Tiguan All-Space TSI R-Line 4MOTION is the real quickie in the range. Boasting 162 kW and 350 Nm from its petrol motor means that the journey can become sporty very quickly. This is the model for the enthusiast. Sporty trim and features like 20-inch Suzuka Alloys, LED Headlights with LED daytime running lights, an Adaptive Chassis Control system, Heads-up Display, Adaptive Cruise Control and Easy Open and Easy Close access to the doors and tailgate make it a mouth-watering proposition. 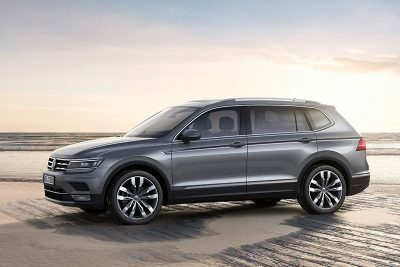 Which brings us to the final model in the Tiguan All-Space line-up, and it’s the TDI Highline 4MOTION with 110 kw and 340 Nm output from the very efficient turbo-diesel power plant. An average fuel consumption less than 7 litres/100 km is an ‘easy reach’ feature. Equipment for this one is the same as you’d find on-board the Volkswagen Tiguan All-Space TSI Highline 4MOTION. One of the lovely attributes of the latest seven-seater Tiguan is the SUV’s ability to cover the road serenely. Long distances can be enjoyed by all. There is a great view outside in any of the seats, and the raised ride height of the SUV makes for a commanding view on the road ahead. The new Volkswagen Tiguan certainly rides smoothly and soaks up the bumps very well; so combine this with a well muted powerful engine and the journey in a new Tiguan feels very relaxed. Poke the Tiguan through the corners quickly and the chassis is nice and settled with excellent grip. You definitely feel like you’re cocooned in a safe place, as the Tiguan All Space is big, strong and well-endowed with superior technology and safety features. Class-leading standard driver aids including Park Assist, Lane Assist, Side Assist, Front Assist with City Emergency Brake (City EB), Multi Collision Brake, a Rear View Camera and Driver Fatigue Detection. Front, side and curtain airbags are standard on all models. An excellent Euro cap crash test result of the full five stars was awarded the Tiguan last year, and it performed very well in front, side and pole tests. 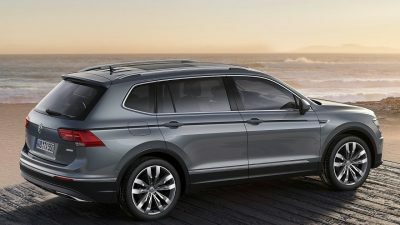 Volkswagen has introduced some new technological features, keeping the Tiguan modern and sophisticated. 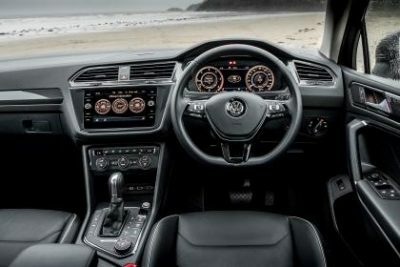 Instant wireless connection to your Smartphone means that through App-Connect the new Tiguan infotainment system that has a touchscreen face connects with you, the occupant, as well as your Smartphone Apps so that your own personal preferences for music, connections with personal friends and other apps of choice make your drive that much more intimate. Inside the cabin Active Info Display and Area View are standard on the 4MOTION and R-line variants. If you have a habit of talking lots, like the Mother in-law, then the communication systems in the new Volkswagen Tiguan are brilliant. Hands-free phone connections and voice control make it easy to chat to new clients and organise appointments. The new Tiguan has a sound system you will be proud of for playing all your favourite music tracks. 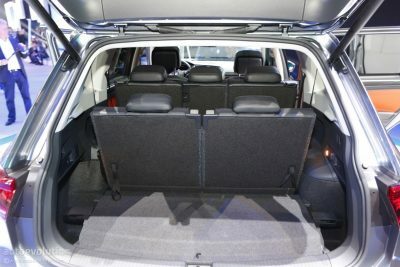 Inside the new Volkswagen Tiguan All-Space, seven occupants will happily chat away in the relaxed Tiguan demeanour. The third row is a little tighter for leg space, however front and second rows are roomy. Highline models boast some exceptionally comfortable heated leather seats. Enjoy the moment and appreciate the new Tiguan All-Space from Volkswagen. For any more information on the 2018 Volkswagen Tiguan All-Space or, for that matter, any other new car, contact one of our friendly consultants on 1300 303 181. If you’d like some fleet discount pricing (yes even for private buyers! ), we can submit vehicle quote requests out to our national network of Volkswagen dealers and come back with pricing within 24 hours. Private Fleet – car buying made easy!